OK I already know I have a problem so we can skip that part. I was on eBay as usual, and found a card with a signature that I KNOW is from at least 2003/2004 yet it appears on a 2011 Topps Finest Cano autograph. Even the sticker on the this Finest card looks ancient. Here is another one. Unbelievable. Want proof of the difference in signatures? Sure, I got it. Now you want proof of the more recent autographs? 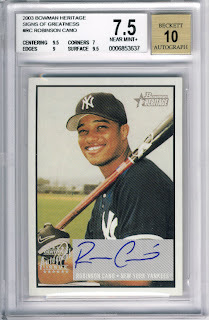 Search for anything 2008 or later of Robinson Cano autos or just look at one of the nicer looking 2011 Finest auto's in this auction. So, does this make me crazy or does this give us all a reason to be pissed off? I don't have a major problem with this. They have the autographs and were probably obtained when Cano was a much cheaper sig. If they didn't use them because they were old, they would just eat them and then Topps loses money. Where does the make up come in? Some of that cost is then passed to the consumer. I see what you are saying Sooz and have heard the same thing from Topps. Why not use those stickers on "vintage" card designs? Make it at least fit the card. I also wonder what kind of grade would these cards get if one submitted them only because there are plenty of cards from his earlier years that didn't get 10's on the autograph, so would that affect these cards? I would definitely want to hear someone's opinion on whether or not that would bring the grade down considering the signature doesn't match his current one or the current year card. This actually looks like the kind of sticker (rounded edges with no holographic design element or "TOPPS CERTIFIED AUTOGRAPH ISSUE" disclaimer) that Donruss-Playoff used in the early-to-mid 2000s. Did he ever sign for them? Cano never signed for Donruss.... So that would make it even weirder. So... Cano never signed for D'Russ, BUT Topps just issued a Cano bearing a sticker AU that looks like it came from an early-2000s Donruss product? Maybe they just switched to a new sticker supplier? But if that were the case, why don't any of the other players have the same kind of sticker? BTW: This is what a Donruss-Playoff signed sticker looks like. Ever signed Topps sticker I've ever seen has the "CERTIFIED AUTOGRAPH" disclaimer printed on the sticker. Yep. We have a reason to be pissed off. The only problem is that this is reason #6382 (and counting) to be pissed off about how the product for this hobby is produced and marketed to us. I don't remember when sticker autos first showed up, but I'm pretty certain that collectors never asked for them. What I do remember are the complaints about excessive redemption cards when on-card autos started taking too long to come back--or rather, production schedules were shortened that allowed enough time to get cards signed and packed out. - Therefore, producing a time-independent library of autographed stickers to apply to cards will fulfill all of these goals. Which left us asking, "So, where's my autographed CARD?" "No, that's an autographed self-adhesive stamp APPLIED to a card." "But it's the same thing." "No. Again. Say I take this to the athlete in person. I have him sign the card. Now I have an autographed card with a previously autographed sticker still applied to it. Now it is a signed card." I, for one, would accept the lower number of total hits in the world as long as the cards are signed directly. Certain players want to charge too much for their scribble? Guess what? Don't do business with them. Ever since a supposed icon like Tiger Woods tarnished his own image by collecting diner waitresses and strippers, the going top rate for living athlete autographs should be much cheaper, based on the ridiculously prodigious supply out there.